Lets face it, we all have clothes in our closet we haven’t worn for some time that for one reason or another we are reluctant to part with. Well, today I have a plan to help you sort out your closet and at the same time take away the difficult part of that task, choosing. Pick a friend someone you have known for a least a couple of years who you trust and value their opinion. Ask them to help you go through your closet and decide for you the items that they feel need to go. Since they have known you for a reasonable amount of time they will know what clothes they have never or rarely seen you in and because you value their opinion they should feel free to tell you which items are out-dated or just wrong for you. You never know you might both have a bit of fun in the process. 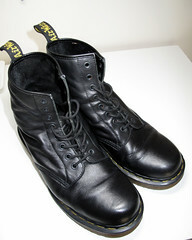 Today’s item – A pair of Doc Martins although good, rarely worn. My heart is breaking – you’re getting rid of a pair of Doc Marten’s boots? Well, they’ve long gone now, since I’m working my way through all the days. I have two pairs of Docs I don’t wear much at all anymore, and I ADORE them. This may be a hard one, I’ll leave it for another day (‘cos I’m a bit of a coward, lol). So far – I’m still on my wardrobe, and there’s now room to move the hangers back and forth – which HONESTLY was impossible to do before. And I haven’t finished yet ! ! I felt that to just do this one thing, and not worry about anything else before this was finished is the way to go, on a personal level. Part of the reason I have so much clutter is my procrastination – just dropping things, meaning to put them away “later”, and then I don’t. So I need to stick to one major thing, to keep myself on one track. 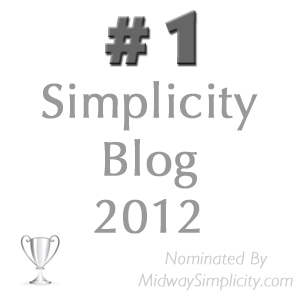 You have no idea how grateful I am for this site – I couldn’t do it on my own. A hug for you, always, Leah. Boa sorte minha amiga (good luck my friend).